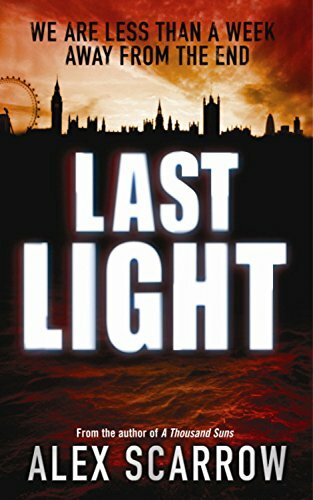 I’m sure that you, like me, watch end-of-the-world scenarios in films and wonder ’what would I do?’ That’s the thought I had reading Last Light by Alex Scarrow. Oil consultant Andy Sutherland writes an investigate report for a client about what would happen if the world’s oil suppliers were cut off. Ten years later, the trigger points he identified start to happen. Within hours, society breaks down. Andy is in Iraq, his wife Jenny has packed her stuff ready to move out of the family home and has gone to Manchester for a job interview. Their daughter Leona is at university in Norwich and son Jacob at private school. They could not be more widely spread. The instinct of the, newly separated, parents, is to get back to their children. The children long for the security of their parents. While in the background, the unknown group causing the chaos has sent Ash to find Leona. The pages of this turn so rapidly you could read it in one sitting on a long haul flight. Excellent stuff. It’s clear that Scarrow is fascinated by the ‘Peak Oil’ scenario at the centre of the story, and it shows on every page. As each of the Sutherland family learns the hard way not to trust anyone, we wonder if they [and society in general] can possibly survive. Click here for more about Alex Scarrow’s adult thrillers, teen series ‘Timeriders’ and ‘Ellie Quin’.